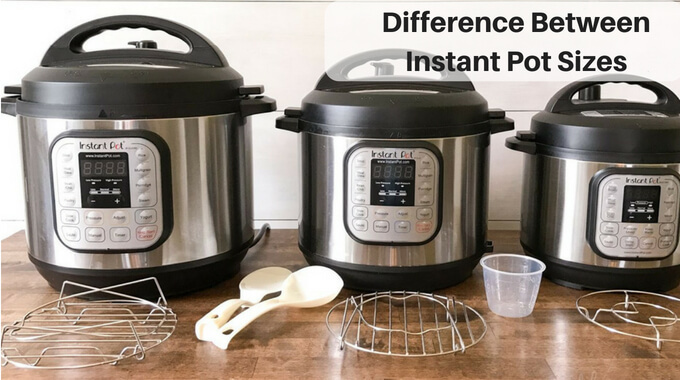 One of the biggest questions around forums is what is the difference between instant pot sizes? 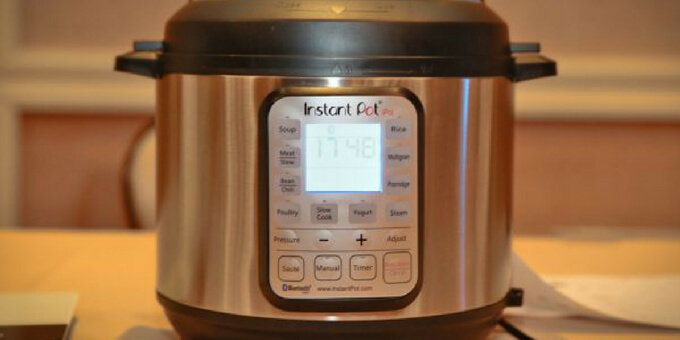 or what Instant Pot size should I buy?” And its something that you need to get an answer before to buy any pressure cooker. 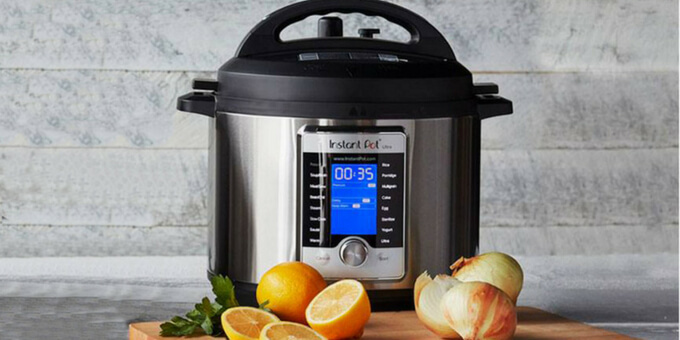 So let’s start by saying that the Instant Pot models are available in 4 different sizes – 3 quarts, 5 quarts, 6 quarts, and 8 quarts. But have in mind that not all sizes are available for all models. The most popular size is the 6 quarts version cause it fit most types of families but check out the table below and keep reading to find out the benefits of each size and compare which model is the right for your kitchen and family. Now that you know the available sizes we are going to review each size and what type of family they can handle as well the capacity depending on your meals. The first capacity is the smaller one with the capacity to handle meals for up to 2 persons, this size is ideal for people that cook for themselves and they usually invite a friend over or for couples. 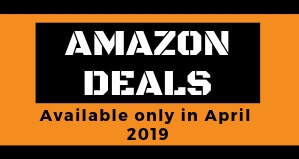 All the 3 quarts version come with almost the same features that come along with the larger versions, although they have the ability to use less space than the other models making it ideal for small spaces, an RV, o for travels. These models can be also a great second pot to have, for example in cases that you want to travel with it, so you don’t have to carry your bigger cooker around. 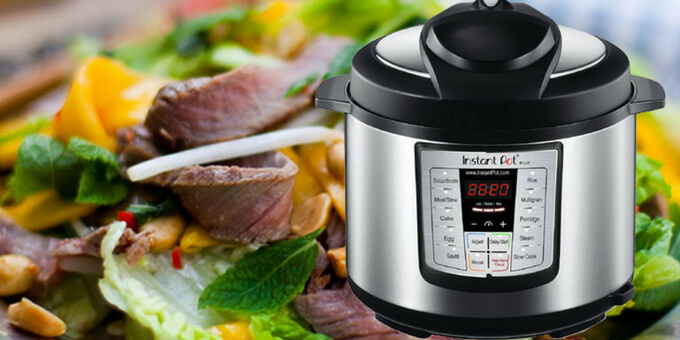 As well in cases like you are already cooking the main recipe on the big pot and you need to cook rice, soups or eggs you have this handy cooker to help you with!. You can make bigger batches of food in the 6 quarts, and if you have the space for the larger pot, there no better than this model. This size is perfect for large families or for people that cook a lot. As well if you are one of those folks that like to get all the food for the week made in just one big batch this is the cooker for you. In case you want to cook for more than 4 people any types of food this size is the one to go, if well the 6 quarts version can handle up to 6 people there are lots of types of food that are not fit for the 6 quarts model, on the contrary wit the 8 quarts version there’s no recipe that you can not make for your large family or group of friends. So the 8 quarts models will use more space in your kitchen and it will take a bit longer to come to pressure compared with the smaller sizes. Although you will have the ability to cook more food on it. 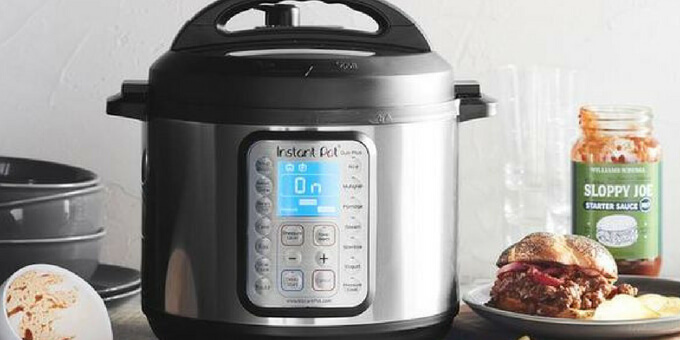 This model is the best choice for those looking the most budget-friendly Instant Pot. Features 6 appliances in 1 giving you a multifunctional machine with the ability to work as a pressure cooker, a slow cooker, steamer, rice maker, saute and keep warm function as well. When it comes to size you can get it on 3, 6 and 8 quarts as well! so you have a good range to choose from. 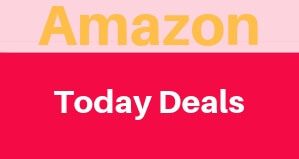 The price difference is due to the lack of the Yogurt function. You may not need to make your own yogurt, although you can also sprout grains and proof bread dough using this function. Another downside from this model is that there no Low pressure with it, so you can only use high pressure. And last but not least there no lid holders either. So if you don’t need any of these extra features then the LUX Series it can be the one that fits you the best. So just like the lux can Pressure cook, slow cook, work as a steamer, rice maker, saute your veggies and keep warm your meals once they are ready. But it also adds the Yogurt function that makes it even more multifunctional than before. It also was on top of the lid holders and Low-Pressure option so they were on top of all the details that were lacking in the previous model. When it comes to sizes just like the LUX the 7 in 1 is available on 3, 6 and 8 quarts as well. This model appears to the market as the upgraded version of the Best Seller DUO, so if you think that they could go any better than the 7 n 1 model you were wrong! This model includes all the same features that the DUO series but it comes with important additions that can make the DUO Plus 9 in 1 the best companion on any kitchen period! So just like the 7 in 1 version this one can function as a Pressure Cooker, Saute, Slow Cooker, Rice Cooker, Steamer, Warmer, Yogurt Maker, but it also adds 2 extra functions the Egg/Cake function that can not only make perfect eggs but also can cook cakes!. But that’s not all this model can also Sterilize your utensils or baby bottles as well! This series is also available in 3, 6 and 8 quarts. Just when you thought that these cookers couldn’t improve anymore, the IP family appears with the SMART edition that can perform all the features and functions just like the DUO 7 in 1 series but it can function as well via internet and Bluetooth giving you the ability to use your cooker even where you are not at home. You can program your cooker from your phone using the Smart App that gives you control of the cooker from anywhere. You can also write, download and upload different recipes. You are able to write a program where the food might pressure cook on high for one hour, then slow cook for 3 hours, and then pressure cook again on low for another 30 minutes. So this cooker is great for those folks that like to get that level of control and they like the Smart houses. When it comes to size you can only get the 6 quarts version for now. 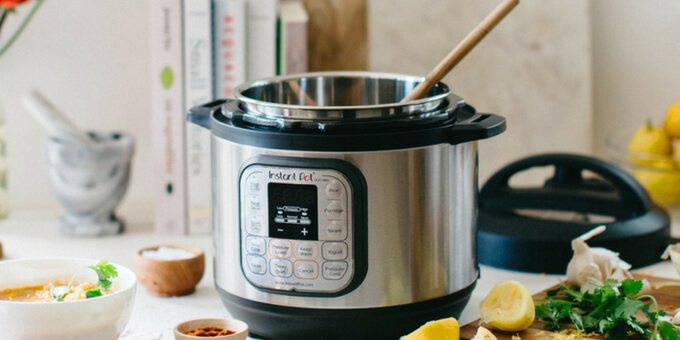 The Ultra is the latest and greatest model from the Instant Pot Family, featuring 10 appliances in 1! It comes in 3 sizes s you can choose from 3, 6 and 8 quarts as well. 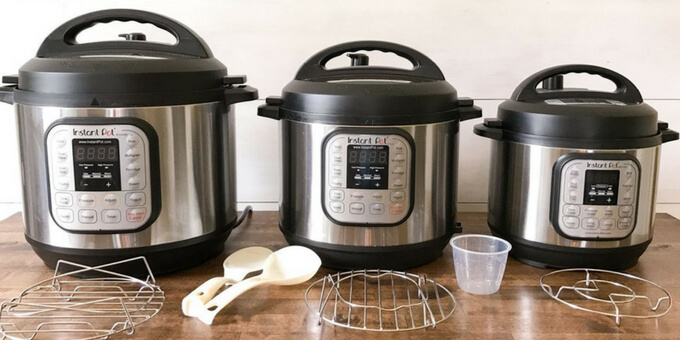 Just like the 9 in 1 model it can be used as a Pressure Cooker, Saute, Slow Cooker, Rice Cooker, Steamer, Warmer, Yogurt Maker, and it also includes the Egg/Cake modes and the Sterilize function. But that’s not all! this series includes the revolutionary ULTRA function that improves all the functions giving you the ability to pre-program the cooker with different cooking times and different temperatures, and also you can choose between two types of pressure. The best size is going to depend on your needs both in the kitchen as well the number of people that you normally are going to be cooking for. Don’t forget to check the right model as well. 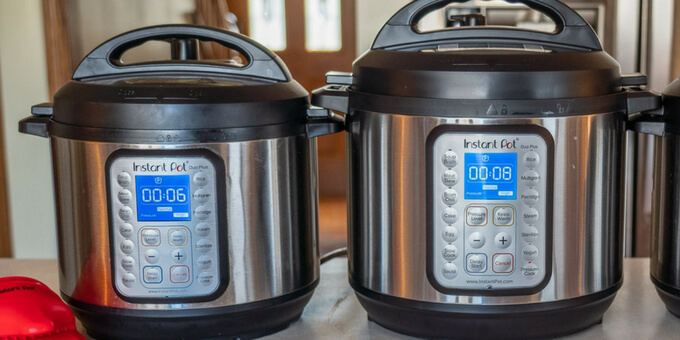 You can check Our Instant Pot comparison or reviews for each model in case you need to understand more about each series. But if you have a medium size family and you don’t need to cook big batches the 6 quarts size is normally the one to go.